Stone Improvement was hired for a hard surface extractor tile cleaning service on this terrazzo staircase in San Francisco. It had been a very long time since the terrazzo staircase was professionally cleaned and sealed. The terrazzo had become rough and dirty due to wear and tear. 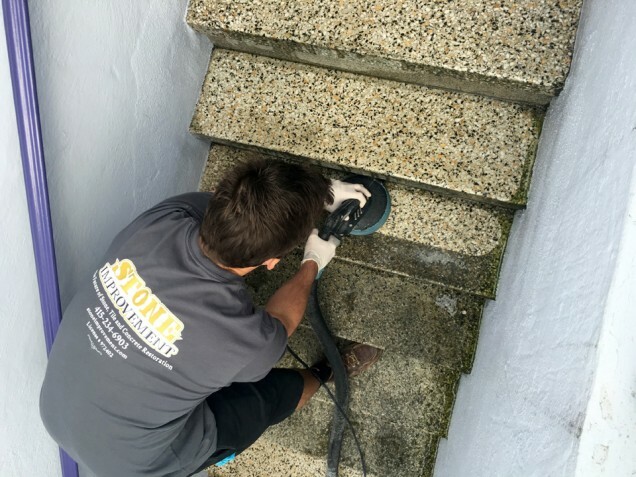 It would have been very difficult and expensive to re polish the stairs so the hard surface extractor cleaning was the perfect option. The tile cleaning made a drastic difference on these stairs. I was able to do the cleaning for a reasonable price and the results were great. After the cleaning we let the terrazzo dry before sealing the staircase with a penetrating sealer. The penetrating sealer does not change the look or sheen of the terrazzo. Stone Improvement services include restoration, cleaning, sealing, polishing, honing, paint and sealant removal, scratch and etch removal on all natural stone, concrete, tile, marble, travertine, granite, slate, limestone, flagstone, sandstone, porcelain tile, ceramic tile, pavers tile, saltillo, terrazzo and brick surfaces. We service floors, counter tops, walls, shower stalls, kitchens, bathrooms, lobbies, fireplaces, driveways, decks throughout the Bay Area including San Francisco, San Mateo, Marin, Alameda, Santa Clara, Contra Costa, Napa, East Bay, Oakland, Berkeley, Emeryville, Piedmont, Montclair, Moraga, Castro Valley, San Rafael, Sausalito, and Hayward.